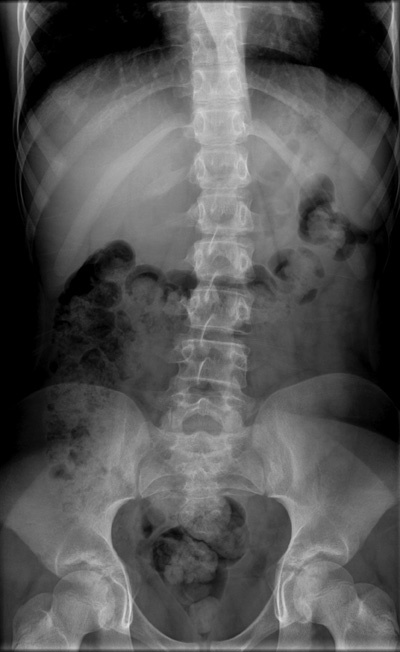 Anteroposterior x-ray shows mild curvature of the spine. Ms. D, age 12 years, pre­sented to the pediatric orthopedist for progressive scoliosis. Other practitioners had treated her over the past 10 months for acute low-back pain. The pain was localized near the right iliac crest without point tenderness. Ms. D had had no recent surgeries or hospitalizations; did not associate the discomfort with any injury, sporting event, or illness; and had not traveled out of the country. She described the pain as aching and constant, with nothing exacerbating it, and reported that ibuprofen controlled it only for short periods of time. At times the pain woke her up at night, but she continued to attend school and dance class. Ms. D’s pediatrician initially ordered lumbar spine x-rays (Figure 1). She was noted to have an 11-degree lumbar levoscoliosis, but otherwise physical examination was unremarkable. She reported no fevers, chills, night sweats, weight loss, easy bruising, dysuria, or malaise. Lab evaluation included urinalysis/culture per another clinician (results were negative). C-reactive protein, erythrocyte sedimentation rate, complete blood count, and antinuclear antibody titer were all normal. Ms. D had undergone a bone scan four months after her initial presentation for pain (Figure 2). The radiologist noted the spinal curvature but no other abnormality, and it was read as negative. (Note the tiny uptake at the right 12th rib.) Whether the ordering practitioner reviewed the bone scan himself or just noted the negative report was unclear. One month later, Ms. D underwent an MRI of the pelvis and spine, which yielded unremarkable findings other than mild scoliosis. At one point, the patient’s mother expressed concern about the amount of ibuprofen the patient was taking, and a second practitioner injected triamcinolone (Kenalog) and bupivacaine (Marcaine) around the area of pain. Ms. D tolerated the procedure well but had no long-term relief of symptoms. One month later, a pelvic ultrasound was ordered; results were normal. The patient continued to take ibuprofen and acetaminophen, but the symptoms never fully abated. She was seen by a third practitioner and was diagnosed at month 10 with a 12th-rib osteoid osteoma. 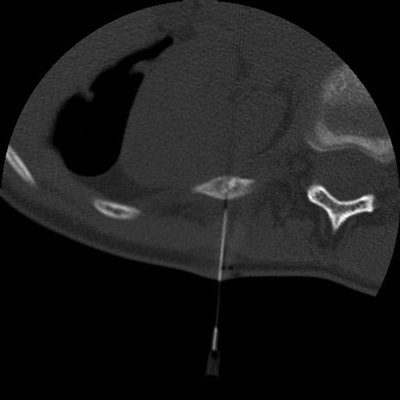 She was referred to an interventional radiologist and underwent a successful CT scan through the lower chest with CT-guided radiofrequency (RF) ablation of the right 12th-rib lesion (Figure 3). Pathology confirmed the diagnosis. Ms. D has reported no pain following the RF ablation. It was noted during her first exam with the pediatric orthopedist that she had a left lumbar prominence on forward bending. She had no paraspinal muscle tenderness and no abnormal cutaneous skin markings. She had full back and joint range of motion. Her motor and sensory function and deep-tendon reflexes were equal bilaterally and intact. She had normal toe walk, heel walk, and deep knee bend. Her straight-leg raise was negative. Her abdominal reflex was slight but symmetric. Standing posterior-anterior (PA) spine films noted a 16-degree dextroscoliotic curve from T5 to T9 and a 27-degree levoscoliotic curve from T9 to L3.